ORIGINAL SOUNDTRACK The Evil Dead: A Nightmare Reimagined (2018 UK limited edition 28-track double LP pressed on 180gram Green Vinyl. One of the most legendary horror scores ever gets recorded & reinventedfor 2018. 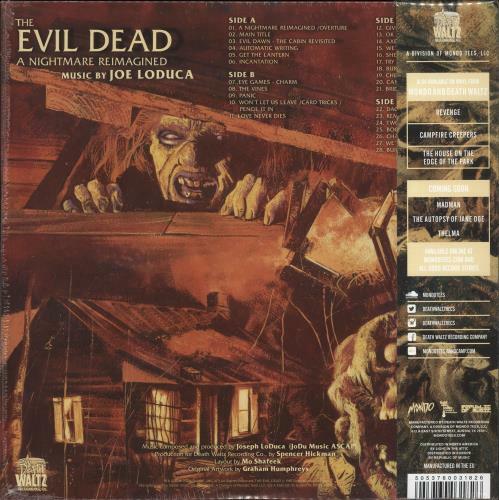 Joe LoDuca went back to the drawing board to fully re-record and expand his original score to The Evil Dead with absolutely terrifying results. The record you hold in your hands manages to keep the essence and familiarity of the originalscore yet feels completely new and exciting due to the addition of all new music combining the classic and the contemporary. 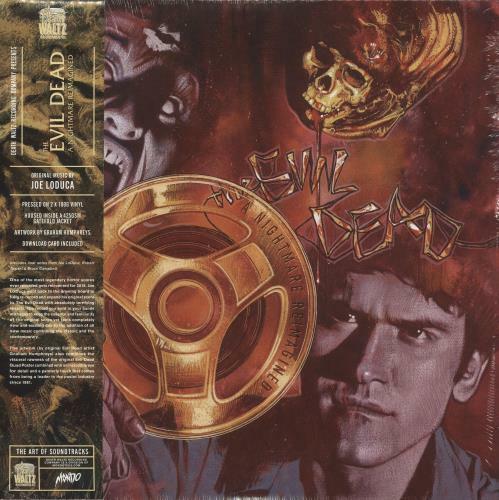 Complete with a download code and custom-printed wrap-around obi insert, the sealed gatefold sleeve features all new artwork by original Evil Dead Poster artist Graham Humphreys and comes with a Necronomicon booklet containing liner notes from Composer Joe LoDuca, Producer Robert Tapert & Star Bruce Campbell! DW112).